So you’ve made a website! Unless you’ve altruistically created some sort of venue for the free-flowing exchange of ideas, chances are you’re looking to capitalize on the economic power of the Internet by offering a particular good or service. You may also want to use, advertisements and affiliate links to draw in residual income from visitors. If you’re a young, strapping, millennial startup, or just a busy parent looking to earn some money on a side hustle from home, you don’t have the budget of established brand names to draw people directly to your site. You probably also do not have the budget for people to type in the name of a popular beverage, entertainment company, or computer manufacturer right into the URL bar. And you probably don’t have the budget to play in the big leagues with established businesses when it comes to SEO (search engine optimization). Which leaves your site as the last one to get picked for the kickball team. So what can you do to actually get people into your digital business? Here are a few helpful suggestions for getting your website off the ground, while monetizing it in the process. One of the biggest expenses in getting a new site off the ground is the design. But chances are, if you fall into the demographics of the self-starters we’re talking about, you don’t have the budget to shell out several thousand dollars for an eye-popping website. The good news is that the marketplace for digital content creation has really exploded over the last decade, which means plenty of competition. In the fight to grab the largest market share in a rising number of people who want their own websites for personal or business reasons, design platforms have become more user-friendly. It’s hard to say which one is the best; it really depends on your personal tastes and preferences. However, these design platforms don’t require any knowledge of coding, HTML, Java, or any of the other unique digital languages that sound like cyborg cultures from a different planet. Most of them are drag and drop arrangements. In some cases, the site is already built, so you don’t need to have a degree in design or an understanding of color palettes to avoid clashing colors or creating nauseating layouts. Simply input text, make a few color selections, put in some pictures, and boom! 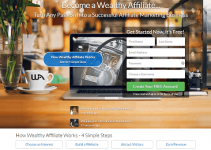 You have a website for a low monthly fee. Now that the easy part is done, and you’ve established yourself with probably something like less than $50 a month, you’re ready to move on to the hard part: getting traffic. If you’re honest with yourself, you’ll be able to accept the fact that there many sites out there similar to yours that are getting a lot more traffic. Don’t feel bad; get glad (hopefully that phrase is not copyrighted). Leverage the traffic of that other site to bring traffic to you. That’s right…you can be a website pirate, swinging across the space between ships with your hands on the rope and a sword in your mouth. Swashbuckling your way to the precious cargo of online visitors. You may even pocket a few before returning to The Black Turtle, or whatever you have named your vessel. But the best part is, you don’t have to be doing something wrong. Websites are happy to share visitors with you, at least the ones we’re suggesting you partner with. This is because they are looking for guest posters or content contributors, and they fully expect that you’ll want to plug your own gig at the end of the article. First go to everyone’s spiritual advisor, Google, and ask it to help you find blogs in the niche you’re writing about. Checking each blog to see if the footer of their landing page says anything about contributions or guest postings can be time-consuming; instead, try conducting site-specific searches, once you have a list of blogs. Type site:[name of the site] “contribute” into the Google search bar to see if that blog offers opportunities for guest posting. For example, if you have a blog that discusses travel-related products that guide readers to affiliate links, and you’ve found a travel-related blog called tropicaltravels.com, you would type site: tropicaltravels.com “contribute” or perhaps something like site: tropicaltravels.com “guest” to see if that particular blog offers guest posting opportunities. Guest posting is a great way to leverage the draw of sites that already have a lot of traffic, and get people through your digital doors by engaging with an article or post you write. Once those people are on your site, you’ll have the opportunity to turn visitors into clients or customers. A megaphone is one of those devices that lifeguards and camp counselors use to yell at large crowds of children, telling them to get out of the pool or stop the horseplay. But did you know that you could also leverage the power of a human megaphone to get attention for your business? HARO (Help a Reporter Out) is a free venue where you can advertise the narrative of your website. If you don’t have a great story, make one! Because your goal here is to find some bored member of the press to spin an exciting article around your website. You can also start finding people on social media who are influencers: people with a lot of followers whose posts are widely read. It doesn’t hurt to cold-pitch your good or service to them, and you never know…they might just be willing to get photographed with a product you sell, or give you a shoutout. Sometimes influencers will charge for doing that type of promotion, but it may fall within your budget, more so than traditional advertising. If you want to break the ice in a more suave way, spend a little bit of time before you approach your targeted influencer by commenting on their posts and comments. Build up a little traction so they have some vague idea of who you are, which increases the likelihood of a favorable reception. If you can’t win over the big fish, remember there are plenty of smaller fish in the pond. Probably even in your circle of friends. Get them to help you out by commenting on your blog, putting up pictures of your products, or writing posts. They may not have 18K followers, but a few hundred or a few thousand connections on Facebook, LinkedIn or Instagram doesn’t hurt. If you’re selling a product, there are plenty of venues that can direct traffic towards completing a sale. Try this out yourself. Type any product you’d like into Google, and see what comes up. Chances are that if it’s an established, branded product, the brand name site will come up first. But beneath that, you’ll see that a number of other vendors come up, such as Amazon, Target, and Walmart. For more artistic or decorative endeavors, you might see sites like Wayfair, Etsy, and Zazzle listing that particular product. The fact is that when you first open up shop, nobody even knows you exist, so no one is going to be typing your site into the URL. But they do know about online marketplaces like Amazon, so if your product is a searchable item in that monolithic online retailer, then that provides an opportunity to build up brand recognition. Over time this will build traffic to your site directly, and at the very least, do what you’re trying to do on your home base: make money. If you’re not selling a tangible good, but rather a service, you can also find ways to leverage more trafficked sites to complete a sale through a more popular third party. Online retailers like Amazon are venturing into the territory of services, while sites like Udemy and Teachable allow you to sell the intangible intellectual information of your mind through online courses. Use Social Media to build awareness of your site through engaging posts. Connect with new people, comment on other users’ posts, and post interesting, funny, or eye-catching material of your own. It’s fun, it’s free, and it helps things spread like wildfire. Once you’ve gotten a little traction on the digital party scene, run some contests. If your site has a blog, get people to leave behind comments. You can enter their names into a drawing to win a prize to help incentivize. Get people to photograph your product, and issue a prize for the best photo. Get creative with contests and referral programs, such as issuing discounts and coupons to those who sign up for a monthly newsletter. If you have the cash to afford a little boost in this area, sites like ReferralCandy can help you incentivize word-of-mouth advertising. Get off the computer, and out of the house. That’s right…if you’re selling a product, sign up for a booth at a tradeshow or a fair. You may not sell anything (or you might sell more than you were expecting to) but you will showcase your product to tons of people. Capitalize on interactions by handing out business cards and collecting emails. Surprisingly, going old school with real live face-to-face interaction can kickstart trickles of web traffic that eventually build up into a solid income stream. A final word about monetizing your site and getting traffic comes from the wisdom of James Earl Jones’ almost ephemeral character in the all-American baseball classic, Field of Dreams: if you build it, they will come. You can try all the tricks in the book to get traffic to your site, but at the end of the day, if your content is not good, you won’t get return visitors. In that vein, our concluding tip about building up a website is to make sure that people want to come back. Whether you do this with an engaging blog, a great photo gallery, a monthly email, or frequent postings on social media, make sure your content is good. Even without leveraging the complexities of SEO and coding, or paying for advertising, you can use the tips we’ve mentioned to bring digital foot traffic into your store, and in turn, monetize your goods or services. But above all, nothing helps build the permanence of a consumer stream like a well-built venue. Giving Assistant save shoppers money with cash back and coupon codes at a large number of online brands. They also have the option to donate a portion of the cash back earnings to a number of nonprofit and charitable organizations in the U.S.
Is Wealthy Affiliate another scam or not?